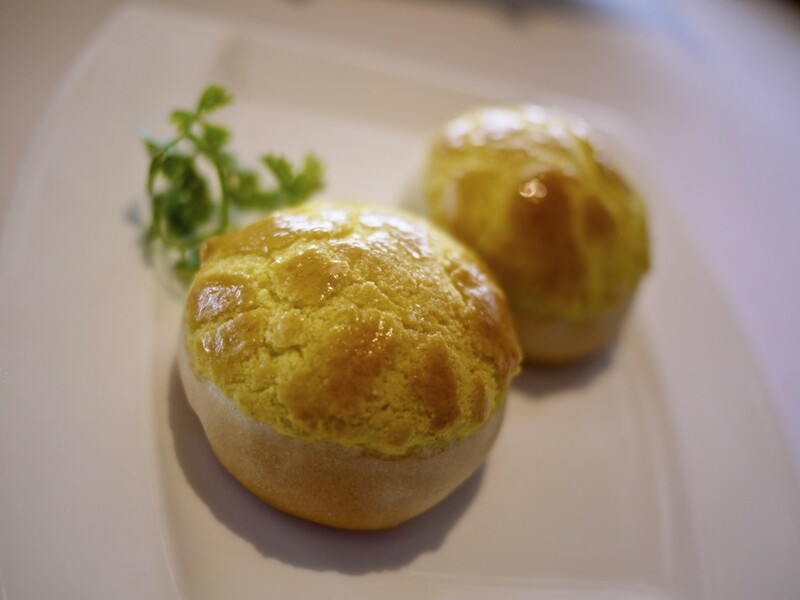 Little introduction is needed to Alvin Leung and his ‘X-Treme’ Chinese cuisine at his two Michelin starred restaurant, Bo Innovation, in Hong Kong. 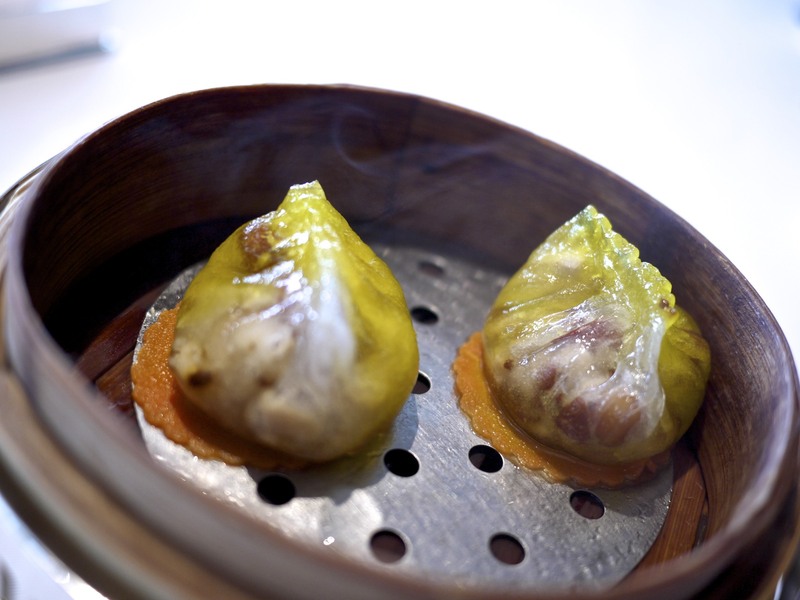 Leung is known for being one of only handful of chefs in Asia who looked to molecular cuisine, when it was starting to take off in the west, and applied its technique to their local cuisine. I’ve had my fair share of good Chinese food throughout my childhood having lived in Hong Kong and Singapore for a good part of my youth. I had also discovered molecular cuisine through elBulli and the Fat Duck. I must admit, however, that I lacked the imagination to envisage what the culmination of the combined elements would look like. More importantly, I wondered whether it would be another case of style over substance, compromising the all important taste. Following a swift journey to my hotel from the airport, I immediately set off for my old neighborhood of Wan Chai. 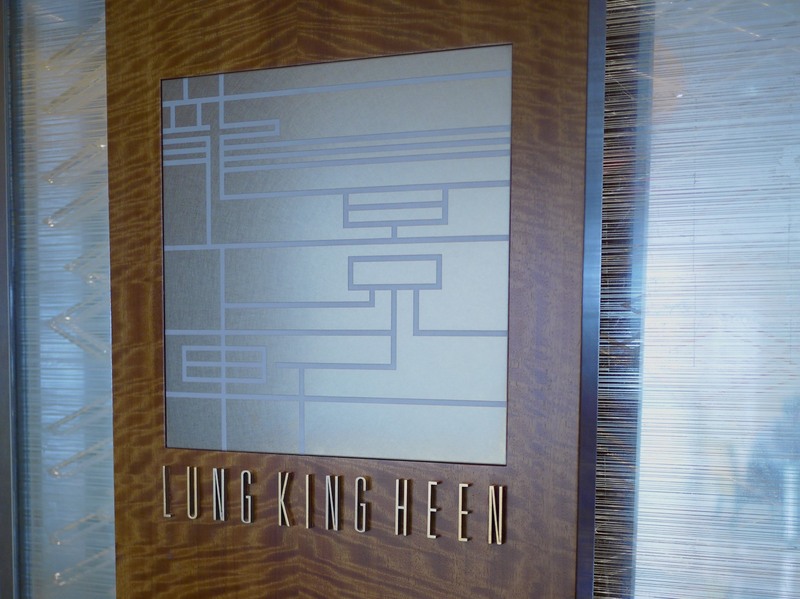 Despite my previous knowledge of Hong Kong, I had some difficulty in locating the restaurant. Luckily, I managed to get some help from a local and, after a brisk walk to a side street and up an inconspicuous lift, I was finally there! I must confess by the time I found my way I was a little flustered. I would therefore advise most people to take a cab. On entering the lift, and after having caught my breath, I left behind the hustle and bustle of the city. I was fortunate enough to have been one of only three people occupying the Chef’s Table that evening, which normally had enough room and space for six. I assume it was a last minute cancellation as the place was packed all night! As the sommelier poured my glass of champagne, one of the chef’s behind the counter explained to me that bread was not typically served with a Chinese meal. 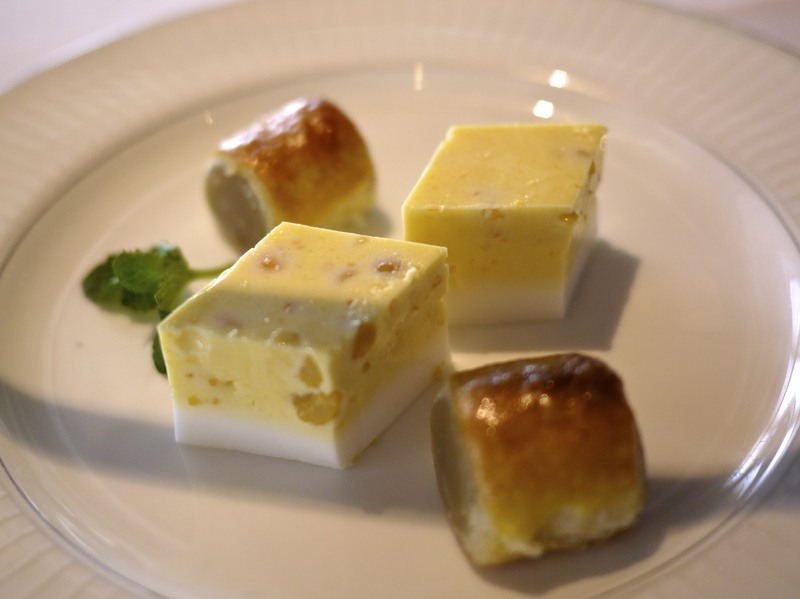 I frowned a bit, I am a bit partial to bread, but before I could interrupt they offered one of Hong Kong’s iconic street foods, “egg waffles”, as a substitute. 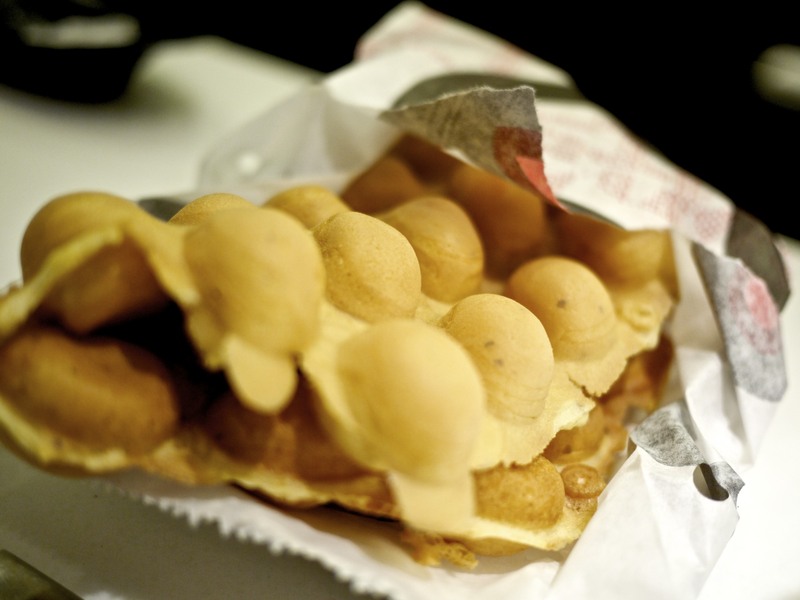 Of course, this was not an ordinary egg waffle. This one contained Iberico ham and English custard. The sweetness of the dough married well with the salty Iberico ham and it was difficult to set them aside to avoid filling my stomach before the meal. Almost immediately after the explanation, a beautiful vessel containing the amuse bouche of a Maotai (local Chinese liquor) sour was brought over to me. 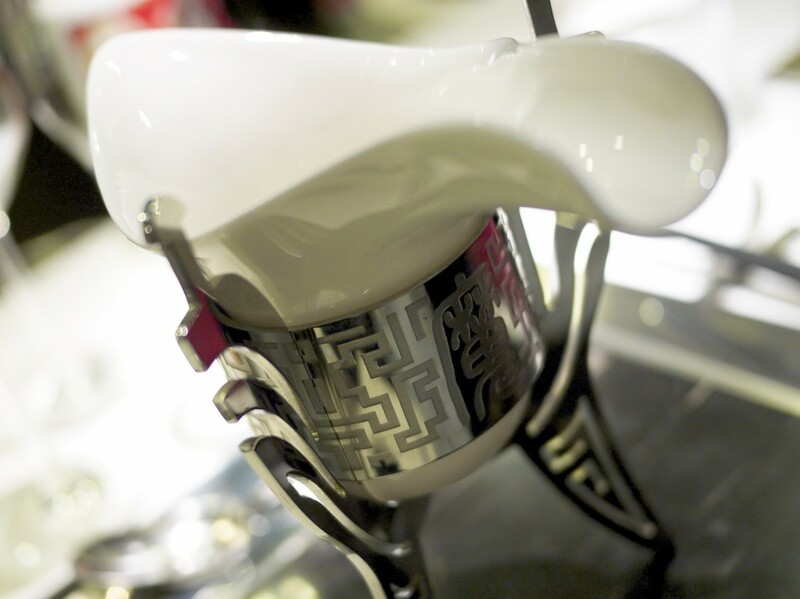 This particular one was made from Kweichow Maotai, one of the most revered of its kind where the tastes were reminiscent of pear, walnut and almond. The addition of the lime, egg white and grenadine made this an extremely refreshing palate cleanser. On to the first solid course of the evening and the caviar, crispy oyster milk and bottarga was an immediate success. I was not aware that China produced black caviar and this particular one was sourced from Heilongjian in the Northeastern region. The bite size morsel was beautiful in flavour and the tuna bottarga (cured roe of the tuna) inside the creamy base was not overpowering despite bringing a distinct note to the dish. Combined with the crispy texture and flavour of the oyster milk, this dish had a lasting aftertaste of the sea, washed down perfectly with a glass of the Domaine J Laurens NV. 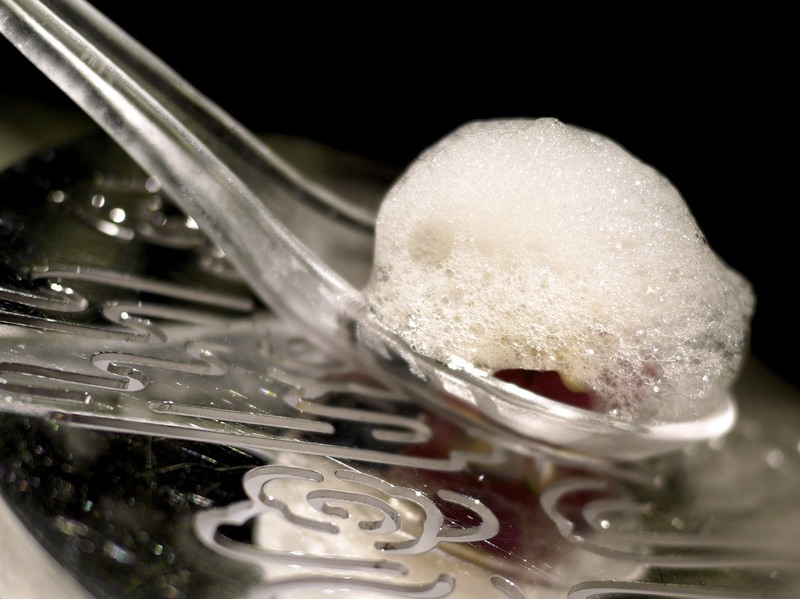 The next course of the Saba, sesame, ponzu cloud and ginger was served on a metal bowl that produced a rose aroma of “parfum de Hong Kong” through the use of dry ice. The oily fish married well with the sesame and melted in your mouth. Ponzu of course is a tried and tested combination that works well with fish and the ginger removed the slight fishiness leaving a clean taste on the palate. 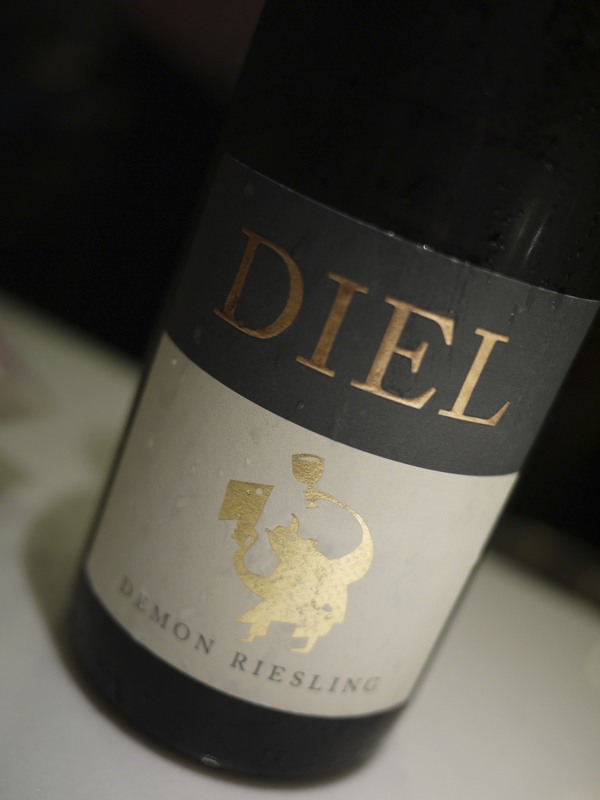 A refreshing glass of Schlossgut Diel – Demon Riesling – Nahe 2010 was then poured for the next two courses. I noticed the logo and immediately realised this was bottled for the Demon Chef! Next up was the Bo Dan Dan Noodles, chilli pepper, pine nut, preserved Chinese mustard, salmon roe, sea urchin, Iberico. The sea urchin from Hokkaido was delicate but not lost in the heat of the chilli. The salmon roe didn’t add much to the dish as it was surprisingly unsalty. The only seasoning component to the dish was the Iberico ham which I probably would have incorporated in smaller portions to spread across the dish. Whilst the flavours were delicate and beautiful, I thought there was a lack of seasoning overall. 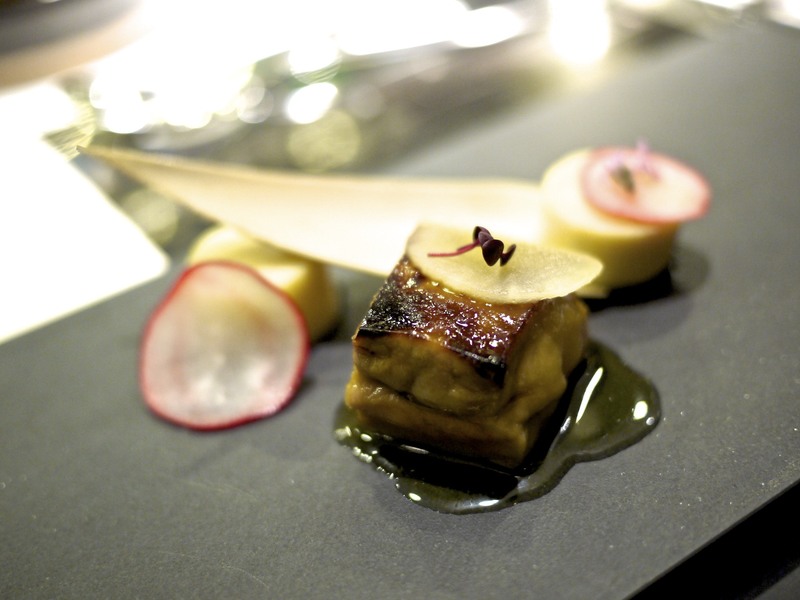 Slightly better was the foie gras, bamboo shoot, “zhou ye qing” liquor miso, pickled Indian lettuce stem. It was a generally sweet dish and the marinade of the liquor infused miso was quite pleasant. 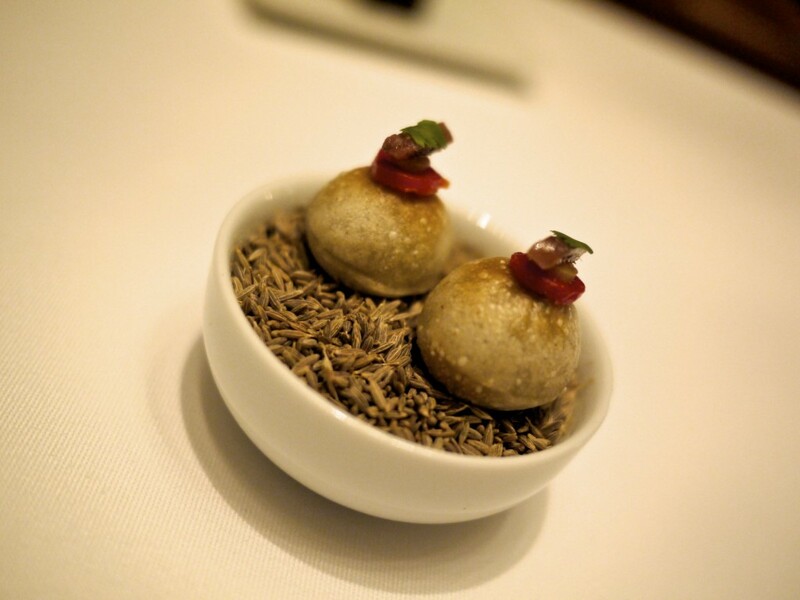 The bamboo shoot and pickle added the textural element to the soft foie. 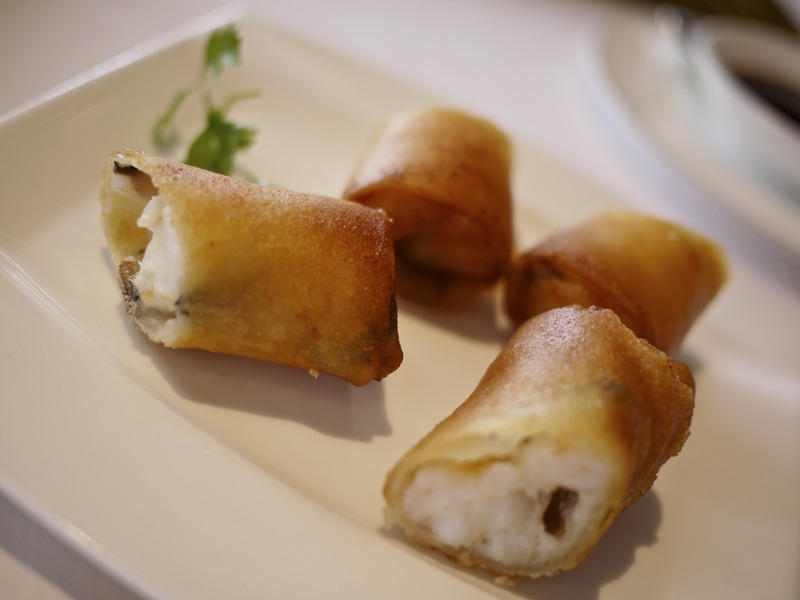 One of the highlights of the meal, with perhaps less visual impact than some of the previous dishes was the Abalone, black truffle and Bo chicken rice. The rice was cooked in a stock containing chicken and Japanese sake and served al dente. 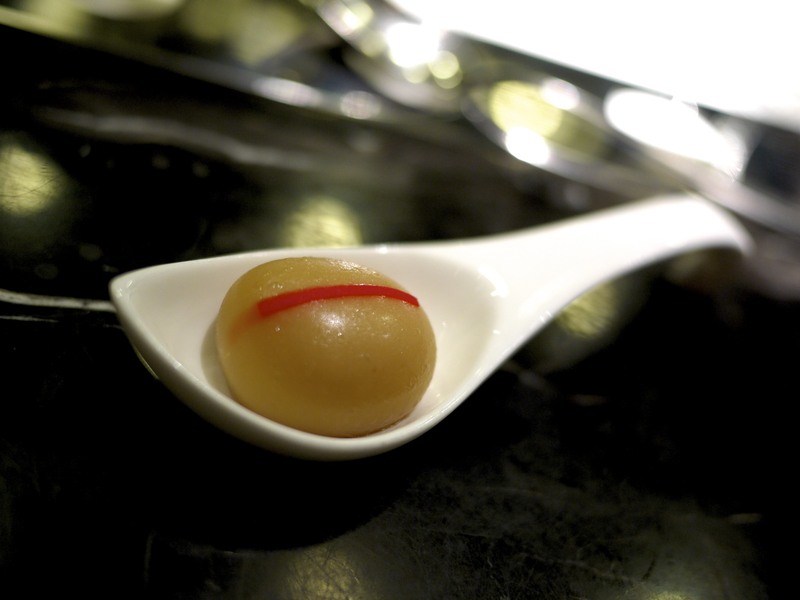 The flavour of the South African abalone was further magnified with the accompanying abalone jelly. 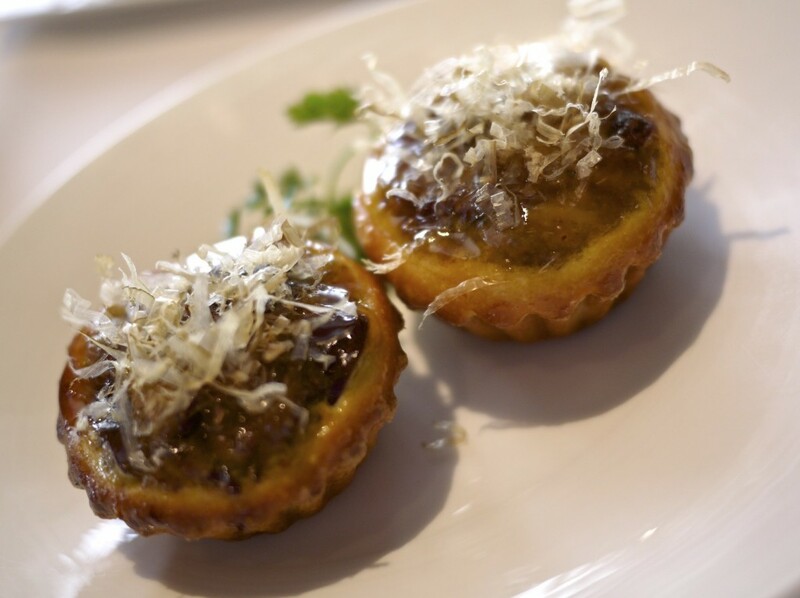 To top it off, the Perigord black truffle added an earthy canvass to the rice making it a marriage of flavour in heaven! This was indeed ‘X-Treme’ Chinese cuisine without a shadow of a doubt. 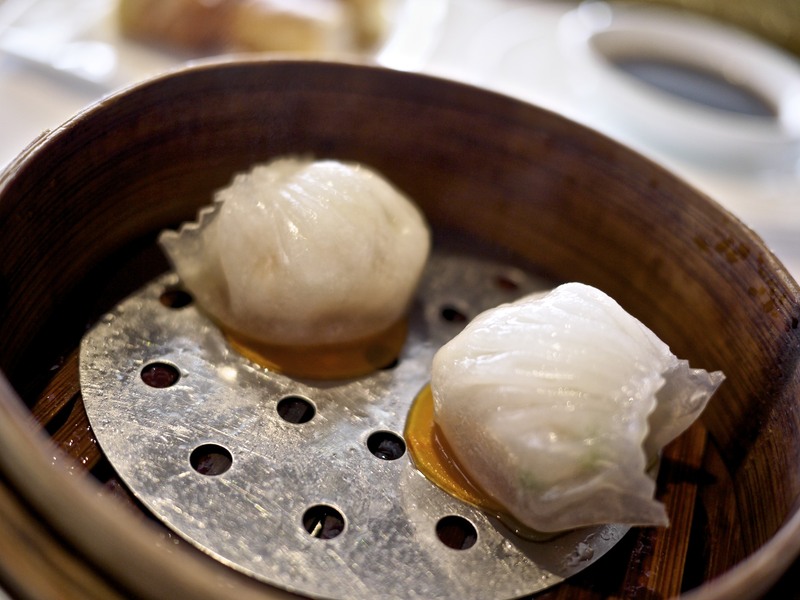 I had heard many people talk about Chef Leung’s signature dish of Molecular “xiao long bao”. 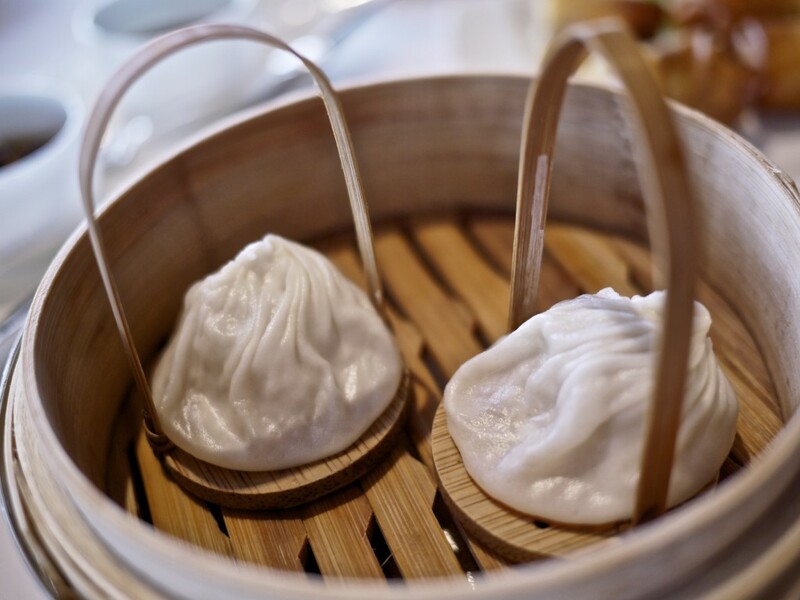 I tasted some of the finest xiao long bao’s during my ten day trip to China two years ago so I was curious to see whether Leung had compromised the dish for the sake of style. I was advised to eat this in one bite as it would literally fall apart after the first bite. Sure enough, there was an explosion in my mouth! It was bizarre to have the flavour of xiao long bao with no texture at all but it was sticky and delicious with a long and rich aftertaste in my mouth. A very refreshing course following the rich xiao long bao was the Tomato, “pat chun” Chinese vinegar, fermented Chinese olives “lam kok”. 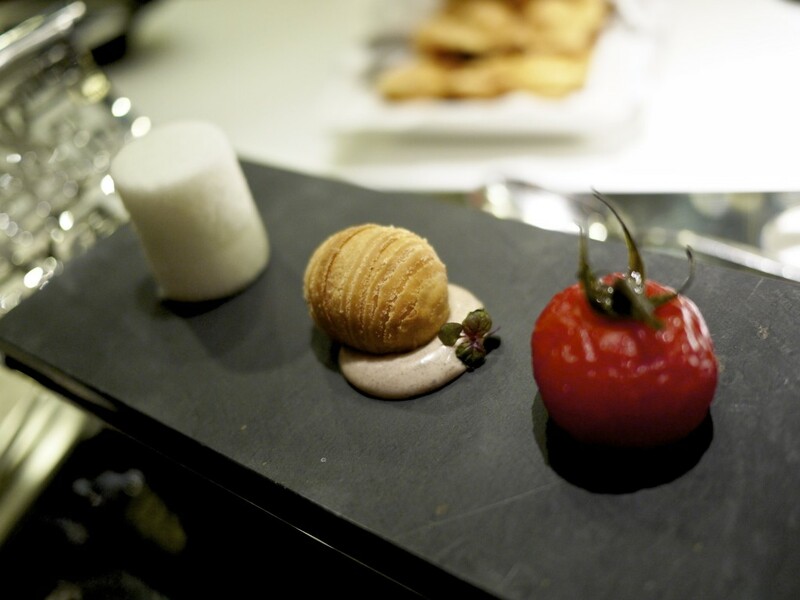 The tomato on the right was cooked in a sweetened black Chinese vinegar “pat chun”, followed by tomato wrapped in Chinese pastry which was then deep fried with fermented Chinese olives “lam kok” from Chiu Chow, followed by an airy tomato consommé tower which incorporated gelatin to keep its shape. 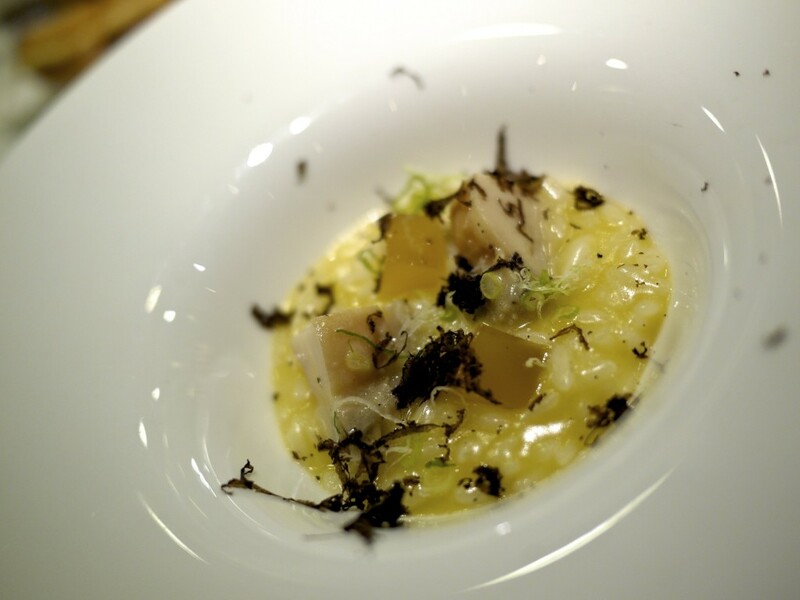 Continuing with the theme of black truffles, the next course was the Black truffle “chian dan chee”. 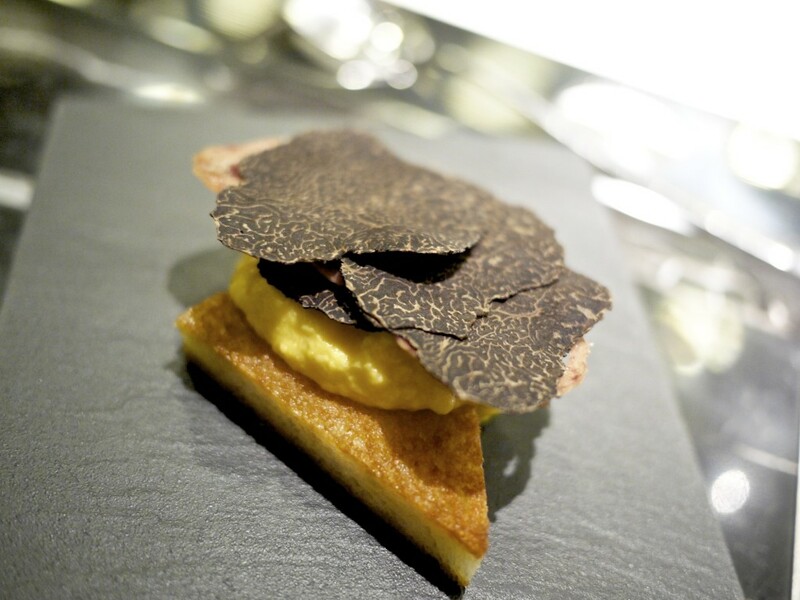 The toast had been cooked in wagyu beef fat which was then layered with truffled scramble egg, dehydrated ham and of course a very generous shaving of Perigord black truffle! The intensity of the truffled scrambled egg and black truffle was very enjoyable and the saltiness of the dehydrated ham was the perfect finish to the dish. I was much more taken by the next knockout dish, Lobster Sichuan butter poached, peas, sweet corn and chili lobster chips. 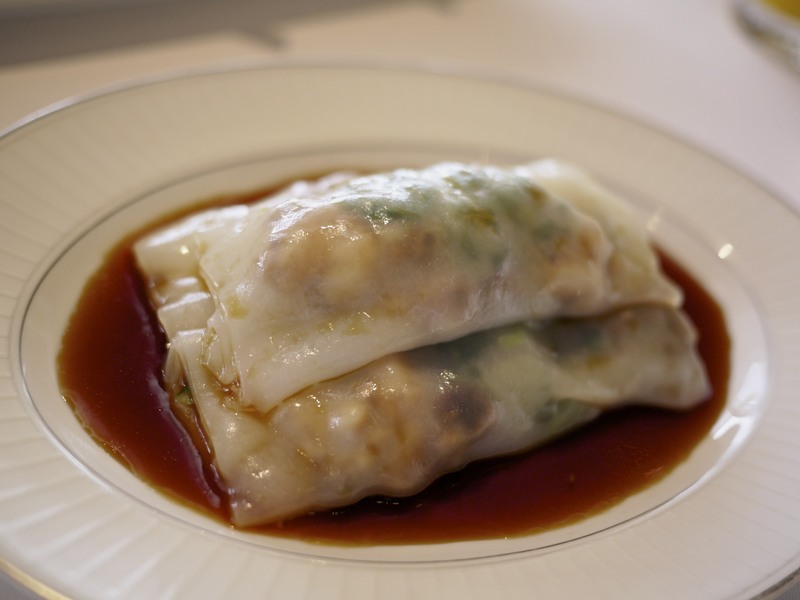 The juicy Boston lobster had been cooked sous-vide with Sichuan pepper and butter. I loved the moderated spiciness from the Sichuan pepper and the sweetness of the corn and peas, both adding depth and complexity. I’m not good with extremely spicey food like authentic Sichuan cuisine but this had just the right amount of heat for me. The chili lobster chips reminded me of concentrated lobster bisque. Overall, this was my favourite dish of the evening and this alone was worth the fight against my jetlag during my meal. I thought it would be a hard act to follow the lobster dish but I wasn’t let down by Chef Leung on the subsequent meat course. 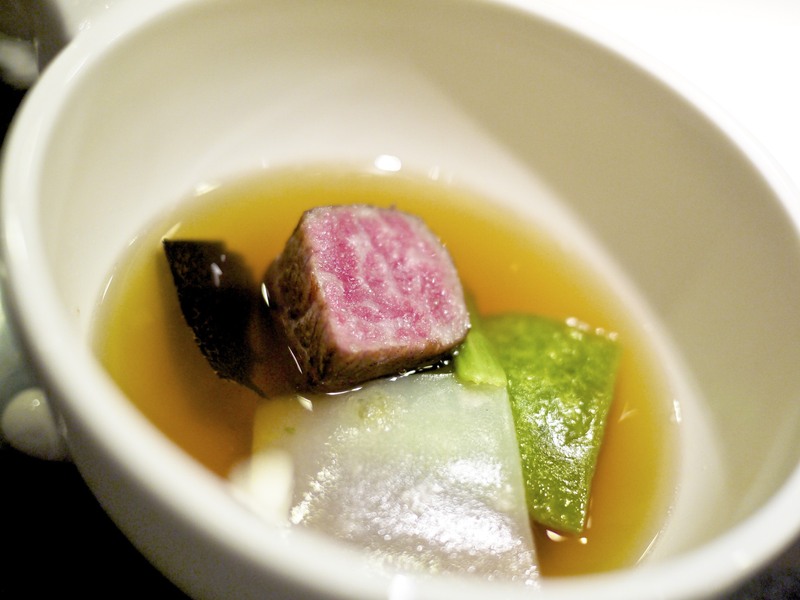 The star component of the Saga-gyu beef, truffled tendon, Chinese chive, daikon and aromatic consommé was however a surprise. The tendon was beautifully infused and cooked with black truffles for three hours, while the white and green noodles on the side turned out to be daikon and Chinese chives, which worked harmoniously with the dish. The texture and flavour of the saga-gyu beef was very good and perhaps the easiest of the components, but it was the deep and rich soup that stole the show. It took 48 hours to prepare this soup, incorporating a good balance of spices including cardamom, bay leaf, aniseed, and cinnamon. This deconstruction of the classic humble Chinese Beef Noodles was the perfect way to end the meal before indulging in dessert. The first of the dessert was the Sandalwood, chocolate and hawthorn. 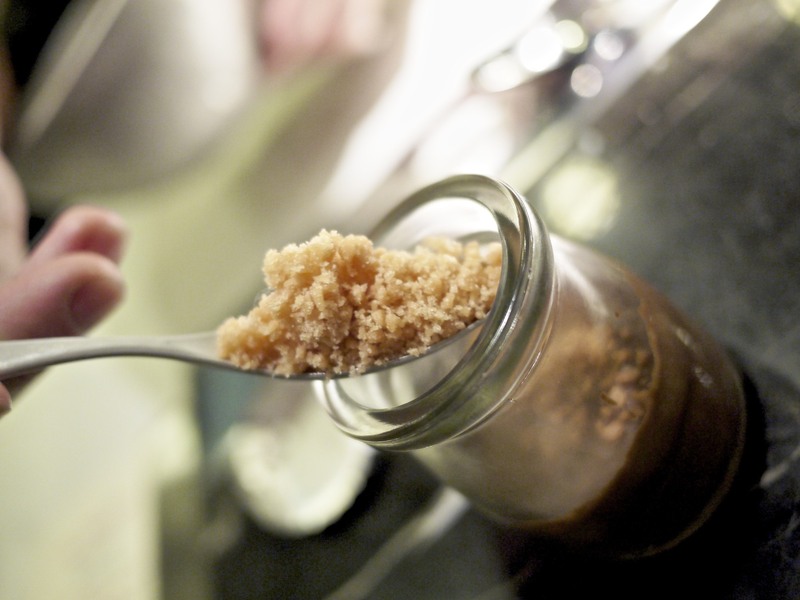 Sandalwood is more commonly used for its fragrance for cosmetic products but in this case its smoke was sealed in a glass tub containing chocolate mousse and dry iced hawthorn. The smoke infused in the chocolate was certainly unique although I wasn’t a particular fan, and I felt the hawthorn was overpowered by the smoke. The trio of ‘lung jing’ tea ice cream, ‘shui jing fang’ caramel and lychee rose icicle were unlike other Chinese desserts I had ever tasted and highly original. 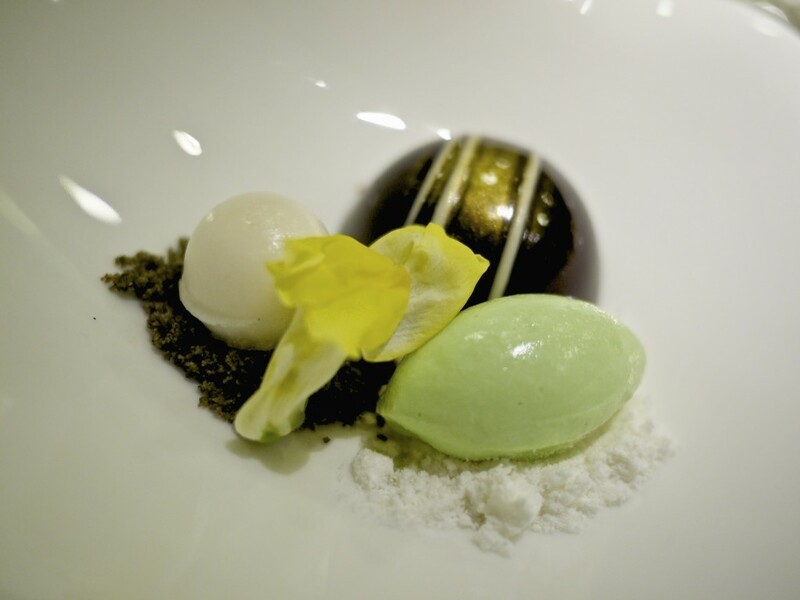 The ice cream resembled that of macha green tea on a bed of dried white chocolate powder and the caramel had been infused with Chinese spirit that retained a significant sweetness. The icicle exerted a beautiful perfume of rose and lychee flavour, completing the trifecta of flavour, aroma and temperature. This dessert was superb and a great way to finish the meal! As I nibbled on the petit fours of the eight treasures, I finally succumbed to fatigue. It was quite comforting to end the meal on a familiar sight of miniature delights but with distinct Asian flavours. 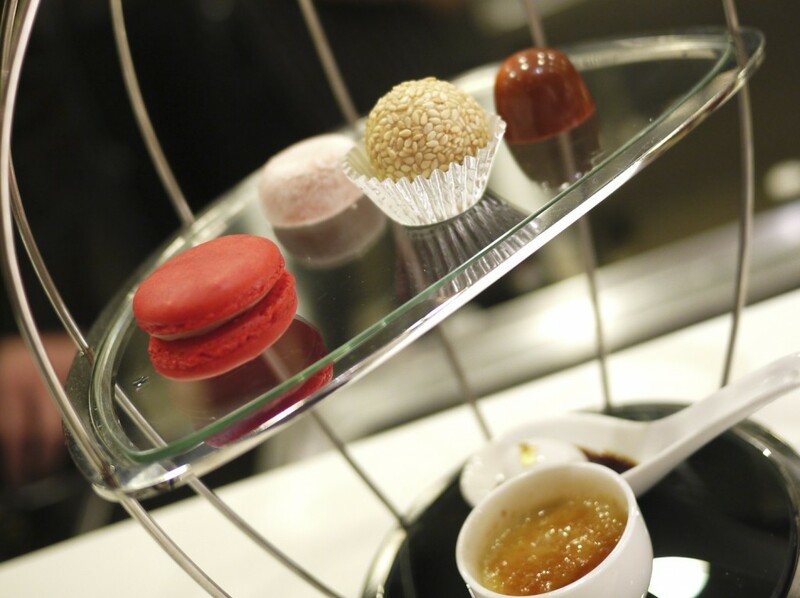 In particular, I really enjoyed the lotus seed, chocolate and stick rice dumpling and the mandarin peel chocolate truffle. 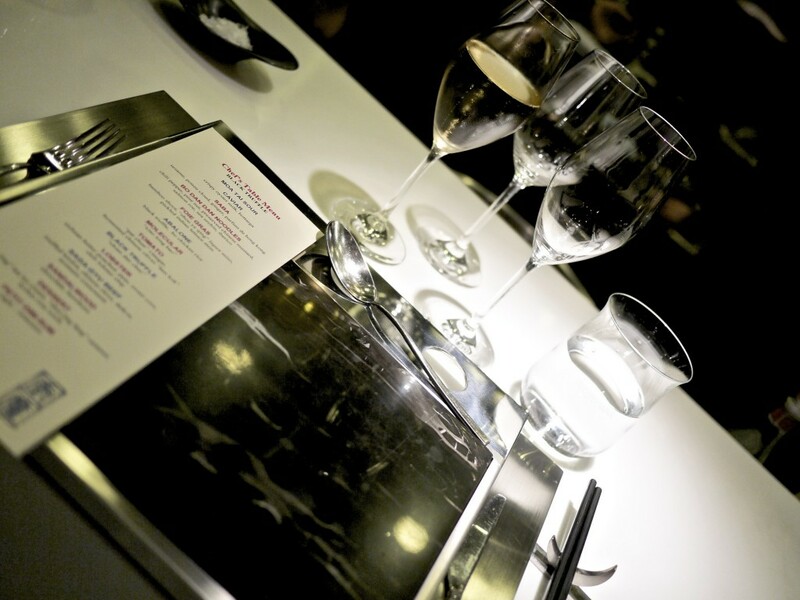 There’s no doubt that the cooking in Bo Innovation was very sound, and I was blown away by most of their dishes. If you took away the Chinese element, the molecular component of the dish was perhaps less dramatic than other places I’ve been to. However, in absence of any gimmicks, the food here is unquestionably serious, real and most importantly delicious. 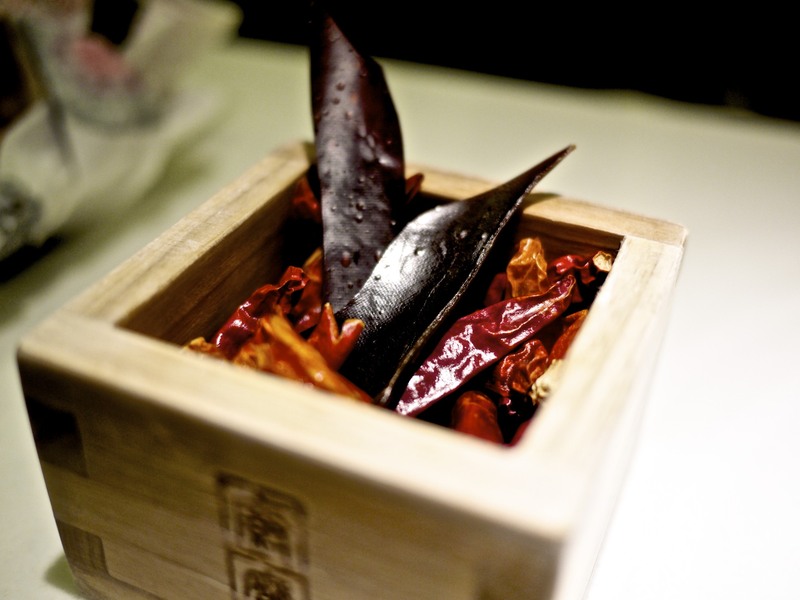 The seamless integration of modern techniques to traditional Chinese dishes using quality seasonal produce has resulted in an unprecedented modern interpretation of Chinese cuisine. I also couldn’t recommend the Chef’s Table any more highly and I enjoyed the ongoing banter with one of the chef de cuisine, David. I personally found in my journeys across China a lack of interest and discord with the front of house and chefs in fine dining establishments. I was comfortable here dining alone and did not at one point feel either bored or awkward. 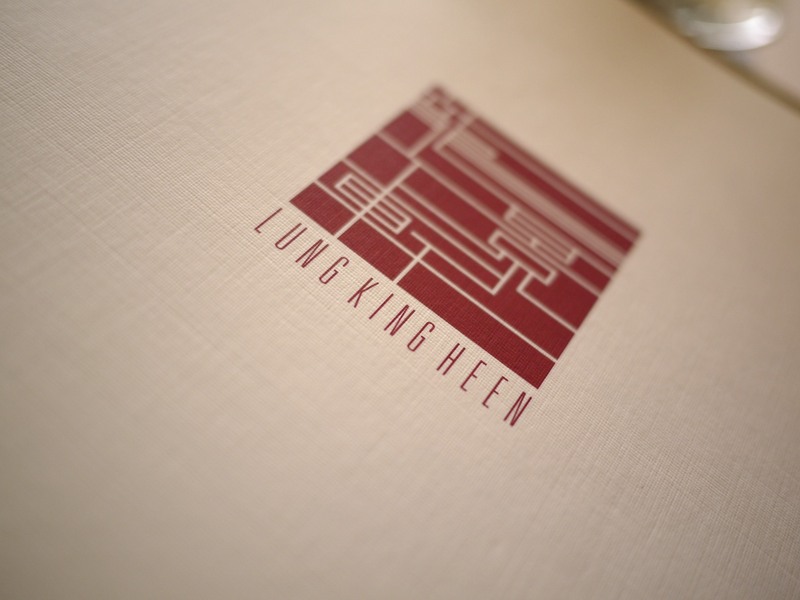 What Asian cities like Hong Kong need right now are more chefs like Leung and restaurants like Bo Innovation to showcase their diverse cuisine and produce in a much more engaging and personable environment. I look forward to comparing this with the tasting menu in Bo London very soon! This entry was posted in Hong Kong and tagged Alvin Leung, Bo Innovation on April 21, 2013 by admin. 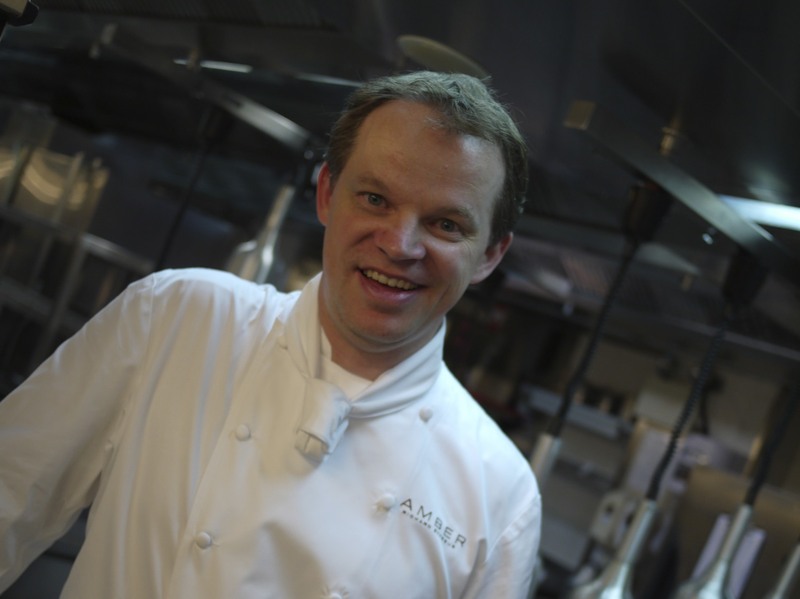 Following two consecutive years of success and recognition as the only restaurant in Hong Kong to enter the World 50 Best Restaurant list, it was no surprise to see Richard Ekkebus’ Amber taking the 4th spot in the inaugural Asia’s 50 Best Restaurant Awards in 2013. 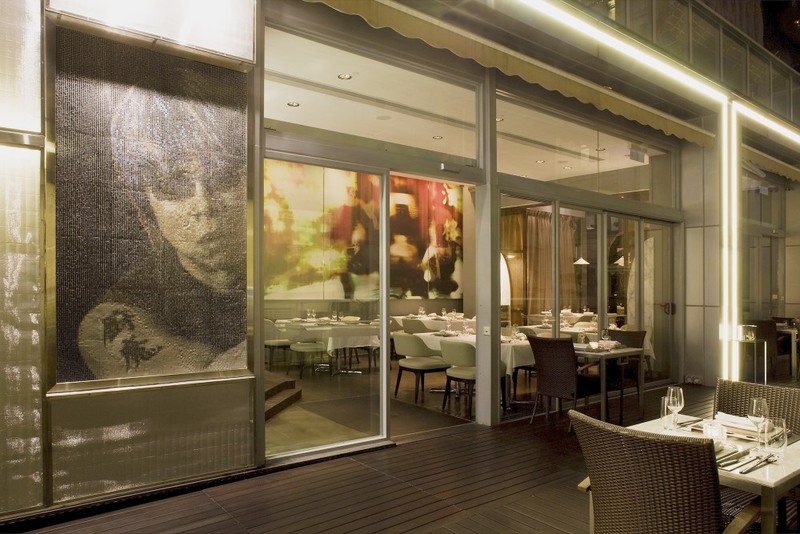 It is Ekkebus, as well as a growing pool of daring talented regional chefs, who has been instrumental in leading the gastronomic revolution in Asia, bringing the regional restaurants to the world stage of culinary excellence. 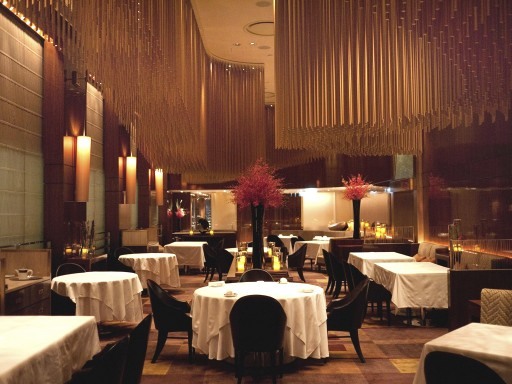 Occupying the 7th floor of the Landmark’s Mandarin Oriental hotel, Amber’s dining room designed by Adam Tihany boasts a luxurious double ceiling throughout. It consists of a special feature of 4,320 gold rods hanging from the ceiling, creating a dramatic visual effect. 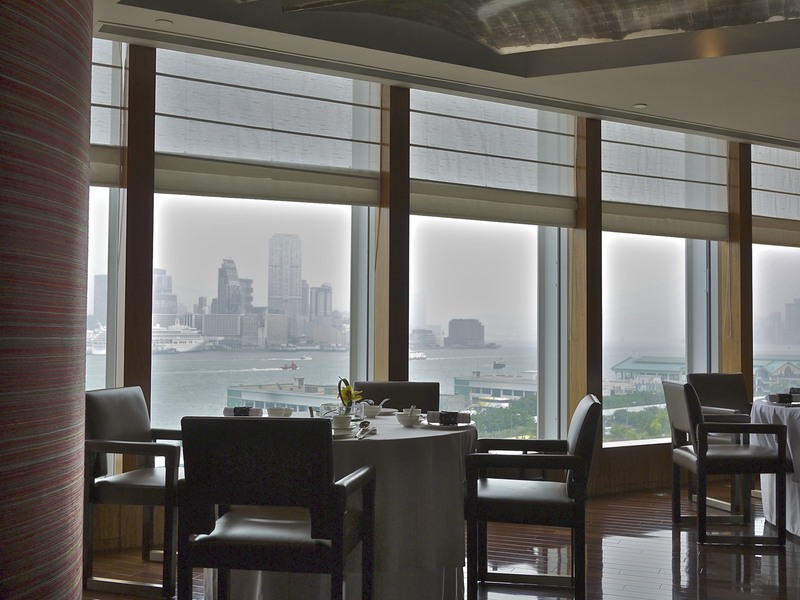 Similar to Tihany, Ekkebus has been inspired by the sense of mobility and internationalism of Hong Kong. This allows him to take advantage of being able to source fresh superior produces from across Asia, applying his traditional French cooking techniques with an innovative twist in presentation. 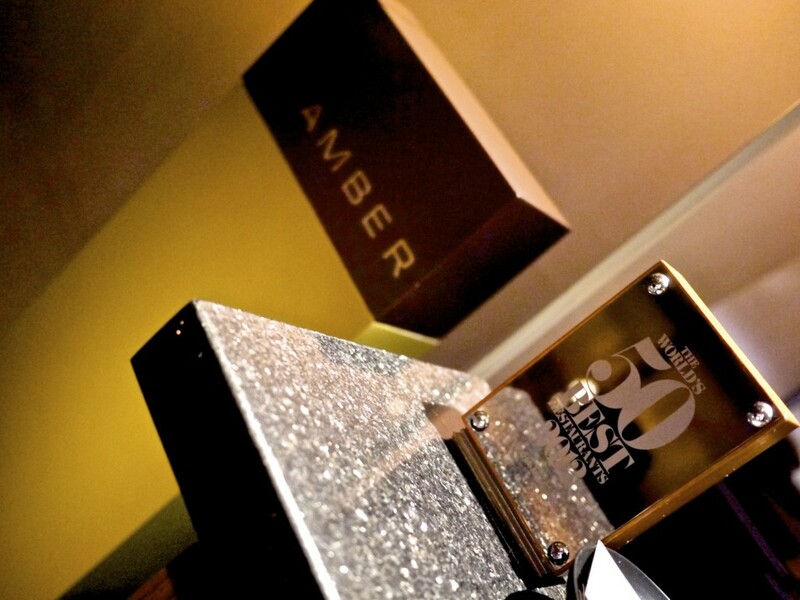 The culmination of these elements makes dining at Amber a gastronomic treat and certainly worthy of the two prestigious Michelin stars the restaurant has been bestowed. I had been waiting for this highly anticipated meal for six months as I had heard so many chefs speaking highly of Ekkebus across the world. 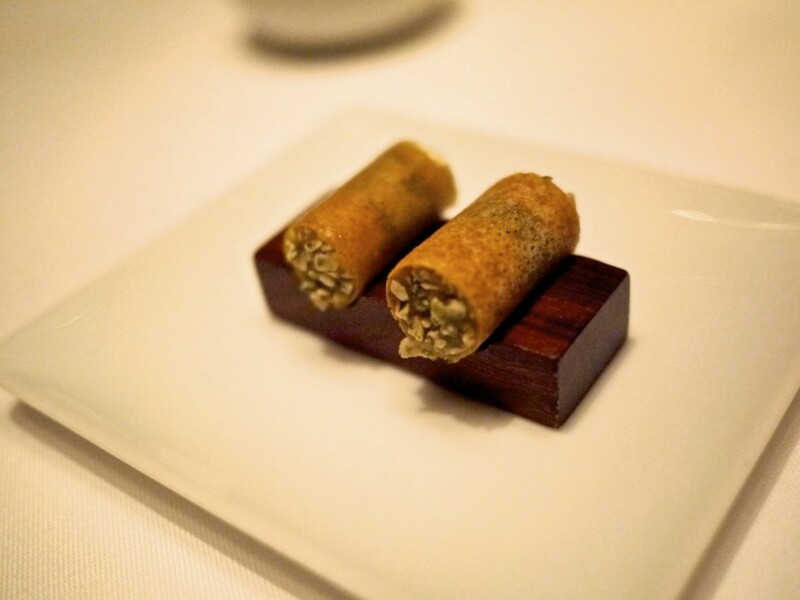 As a glass of champagne was poured, the little treats of amuse bouches started arriving at our table, gradually progressing from the mellower flavours of a canneloni with black truffle coulis, kabocha pumpkin and pumpkin seeds which was very delicate in flavour and contrasting textures of creaminess and crunchiness. The play on texture continued with the pita balls stuffed with aubergine and red pepper which has a slight smokiness to the sweet filling. We were fortunate to be dining in March as Chef Ekkebus managed to source some top quality Perigord black truffles, and he was not shy in making use of them that evening! 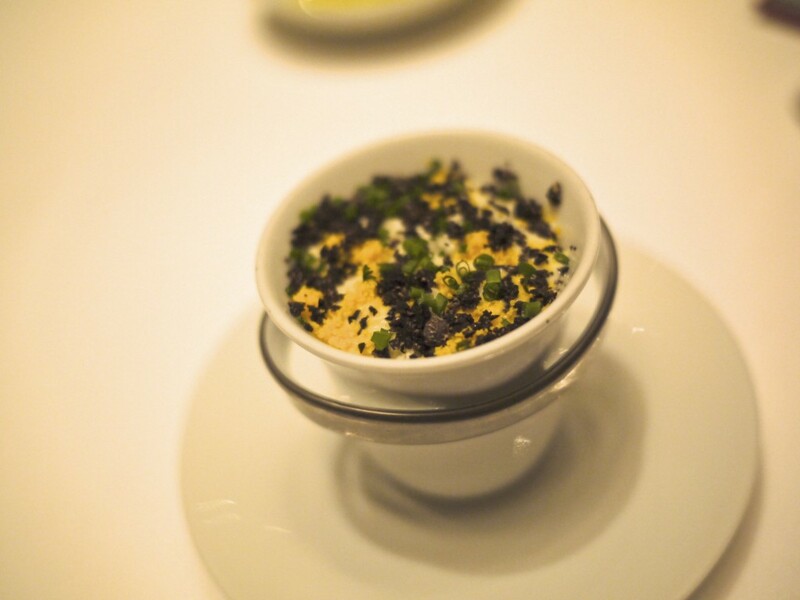 The cauliflower soup with egg sabayon and black truffles was very earthy, refined and in good portion size. 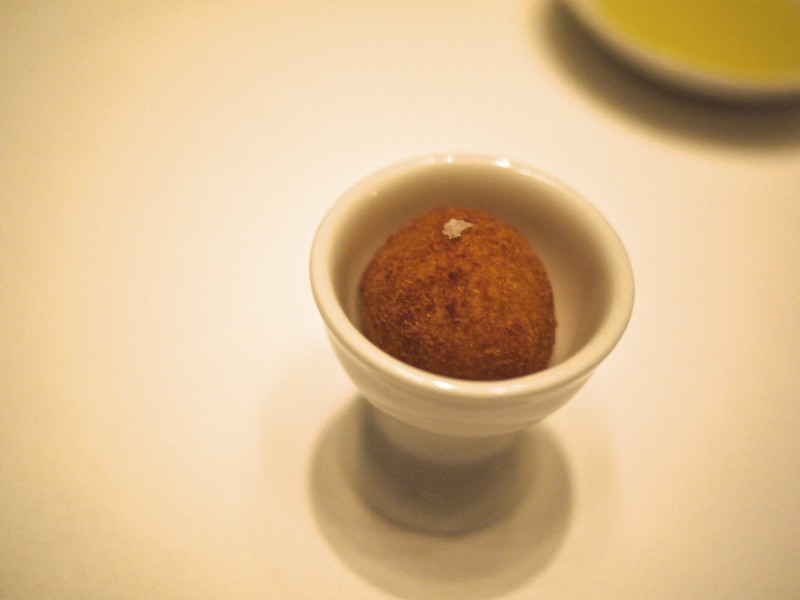 One of my favourite amuse bouche that evening was the Iberico pork and mustard fried ball. The warm filling oozed out and the flavour combination of the pork and mustard was just superb. I particularly liked the contrast of the crispy outer coating to the juicy filling in one bite. I could easily have had a couple more of these! 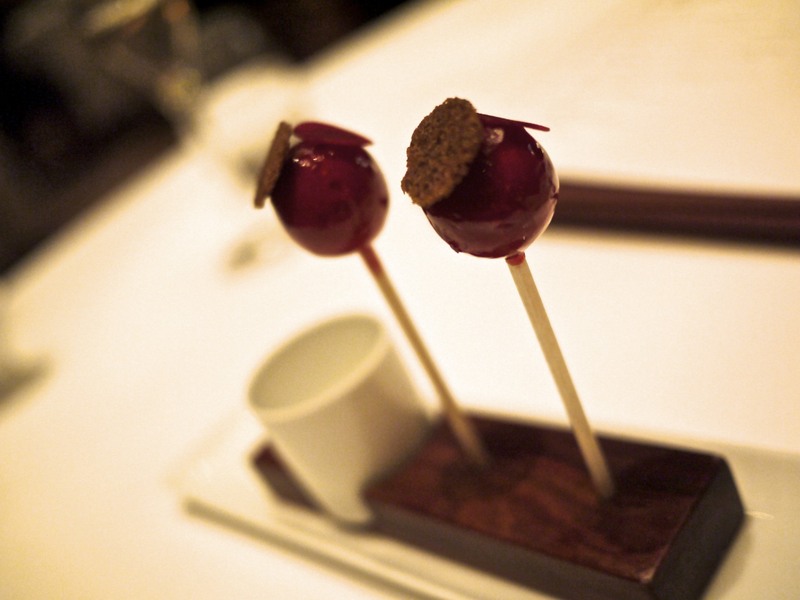 Another favourite was the duck foie gras lollipop, which was perfectly balanced with the acidity from the layer of raspberry coating and the crunchy texture of the gingerbread crisp on top. It was refreshingly cold inside to top it off. As the table was being cleared, the sommelier came over with the first wine pairing of the evening, which was a glass of a very crisp and herbaceous 2011 Domaine Laporte, Sancerre Les Grandmontains. The first course of the evening was an instant hit and almost too pretty to eat. 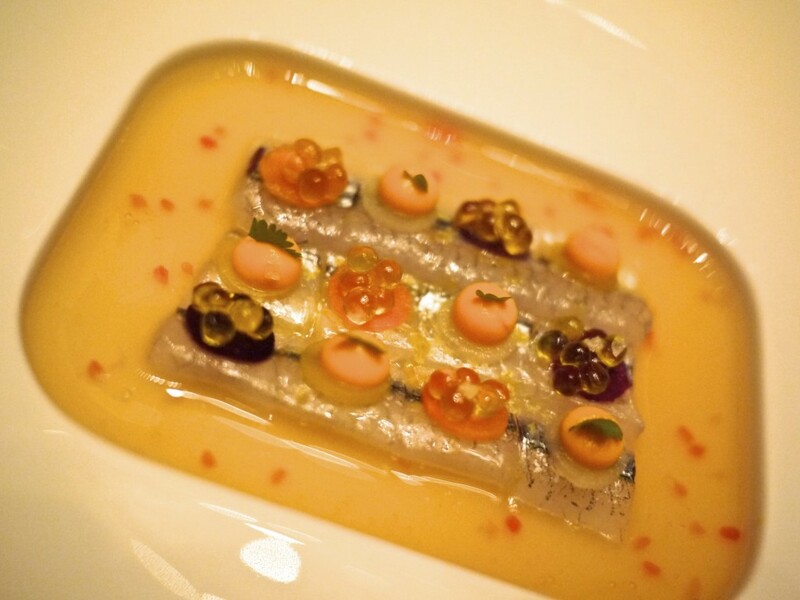 The needlefish ‘sayori’ which had been marinated with olive oil ‘caviar’, heirloom carrots, finger lime and ginger was sourced from Japan and served raw. The acidity from the lime and the carrot and ginger bouillon cut through the delicious oily fish, and the salmon roe provided the perfect seasoning to the dish. 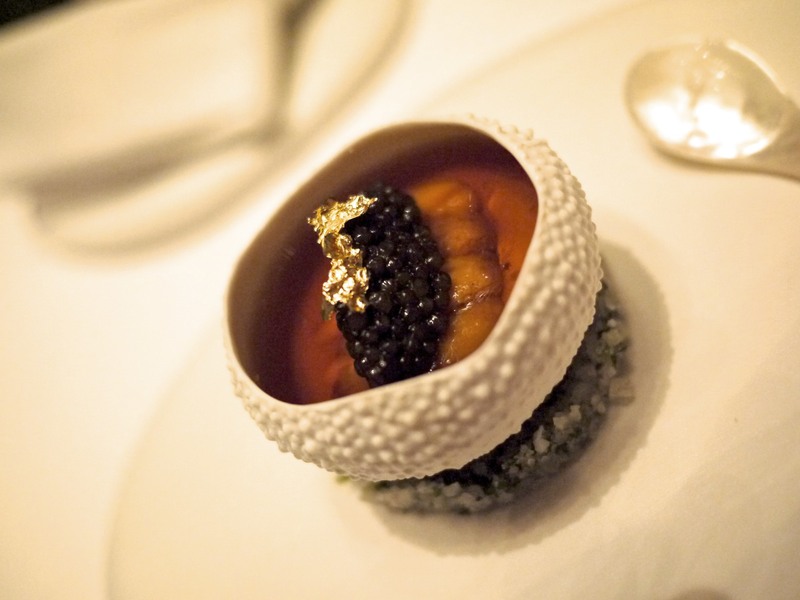 Further impressive was the signature dish of the Hokkaido sea urchin, which was served in a lobster jelly with cauliflower purée and a quenelle of black caviar. 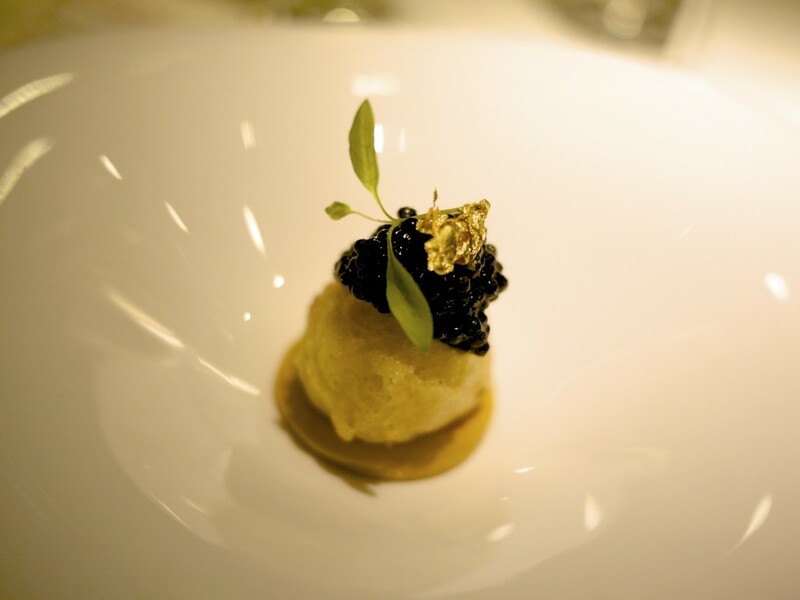 The balance between the lobster jelly, which set a canvass of the flavour of the sea, the elegant and creamy sea urchin, and the salty black caviar was flawless. Moreover, unlike typical exported sea urchin, this one was fresh from the day and did not contain any myoban which gives the bitter aftertaste. It was a delicious taste of the ocean that already justified my trip. 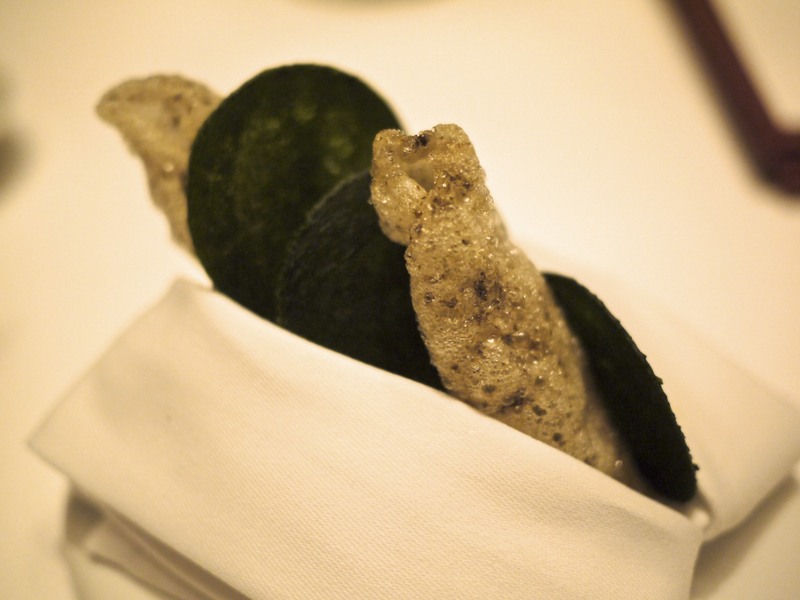 The sea urchin was served with crispy seaweed waffles on the side. The Tasmanian Salmon was an inspired dish. 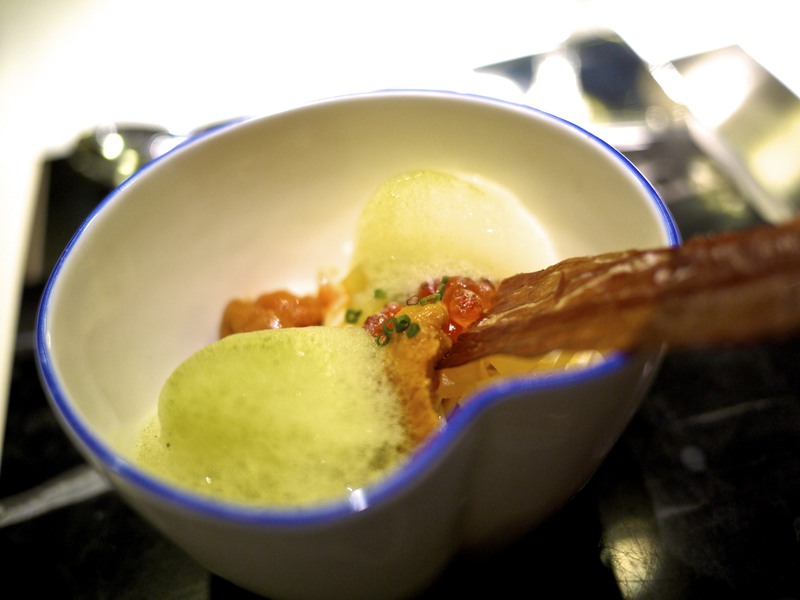 The confit salmon was served as it was still being smoked in a glass bowl. As the bowl was lifted you could smell a lovely woody aroma, and what I thought was ingenious was the way in which Ekkebus infused the smoke into the dish by a second method of using the same glass bowl to serve the accompanying sake of NV Born Tokusen Junmai Daiginjo. 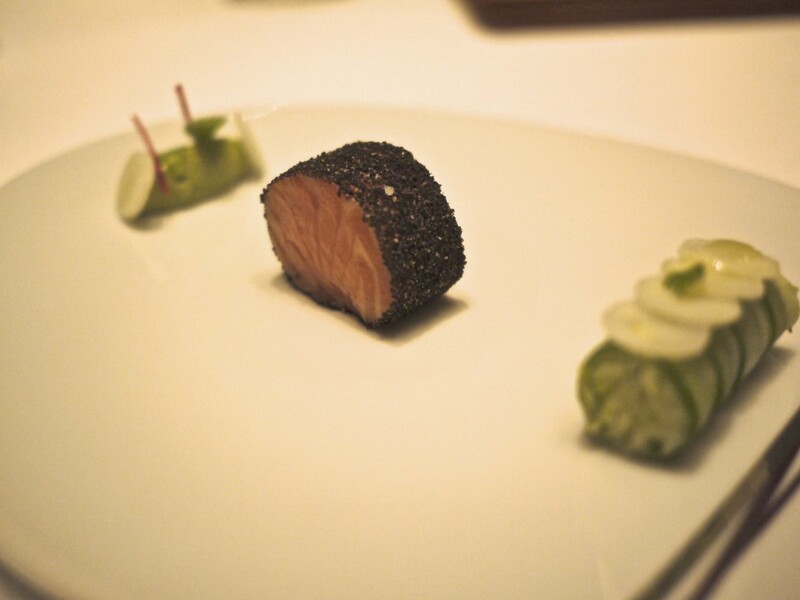 The salmon was covered in squid ink and bread crumb coating and melted in your mouth with very little effort of chewing. I was worried the smoke was going to ruin the delicate salmon but that was unnecessary. The avocado purée and the granny smith apple wrapped in cucumber added some much needed acidity to cut through the salmon and lift the dish, and the horseradish was fortunately not overpowering but present on the palate. 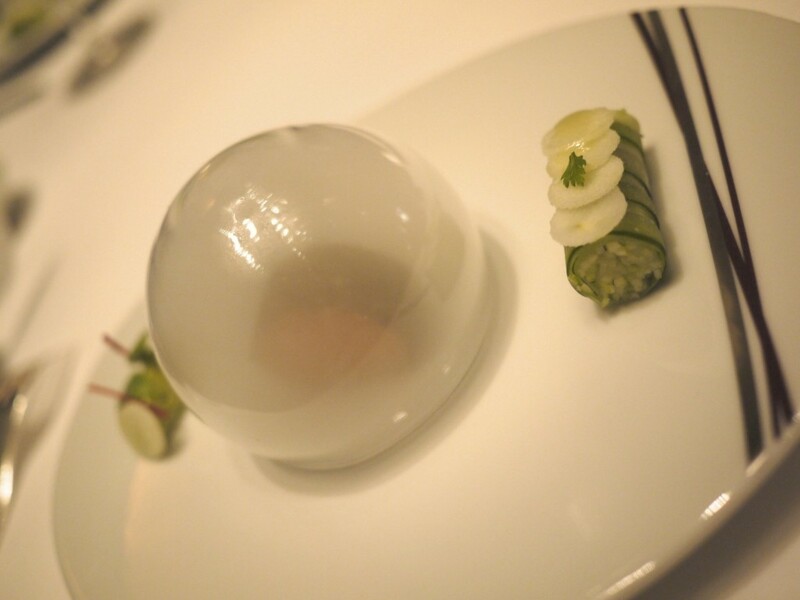 A very well balanced and clever dish that left me speechless! 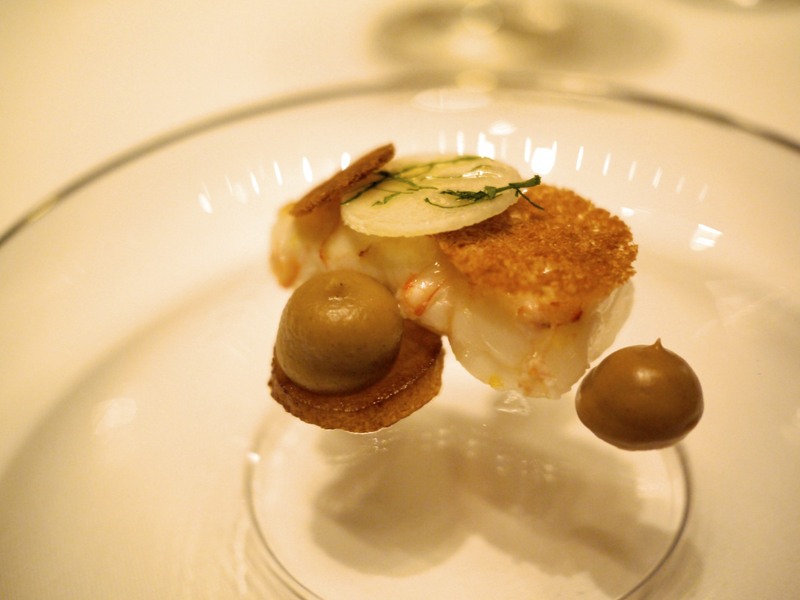 Langoustine seared with bergamot, dark roasted brioche, caramelized parsnip purée and raw “passe crassane” pear. The langoustine sourced from New Zealand was fresh and perfectly cooked with a beautiful juicy texture. The Italian parsley and bergamot made a significant difference to the sweetness coming from the parsnip purée and the pear and the textural element from the brioche completed the trifecta. Takaba Grouper poached with tete de veau, barbecued bell pepper purée, seared firefly squid and spring vegetables from fukuoka. The purée went very well with the grouper and the vegetables had a good crunch to them. Whilst the fish was also good, I must admit it was far less exciting on the palate and visually compared to the preceding dishes. 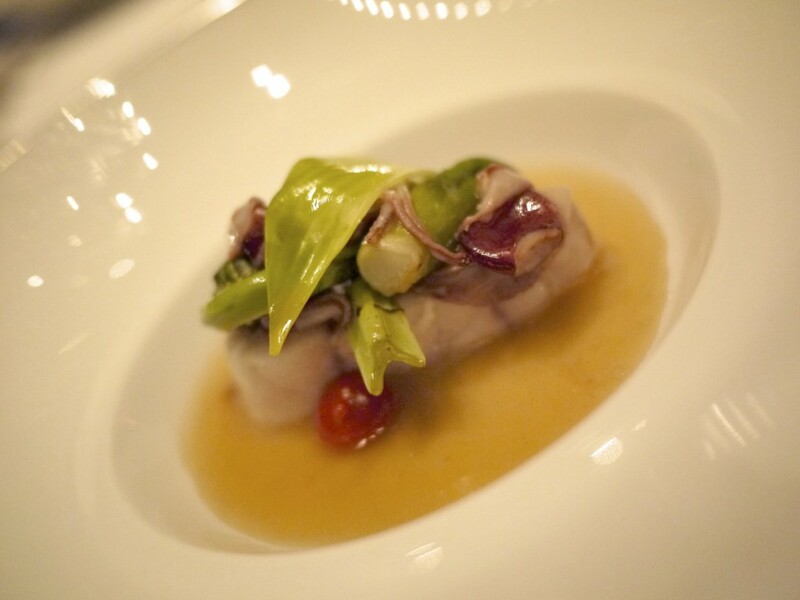 We felt a bit flat to finish the seafood segment of the dinner on the grouper but we were wrong… very wrong! We expected to be served our main meat course next but Chef Ekkebus decided to make a last minute change and incorporate one last seafood dish, which ended up being the best dish of the night! We were fortunate enough to have been served with an off-the-menu special course of the ‘ebisu’ oyster. This had been cooked in its shell at 67 degrees and was served with wilted tetragon, shallots, duck gizzard, pieds de moutons mushroom and vin jaune. It was truly a jaw-dropping dish that married European and Asian techniques, ingredients and flavours. 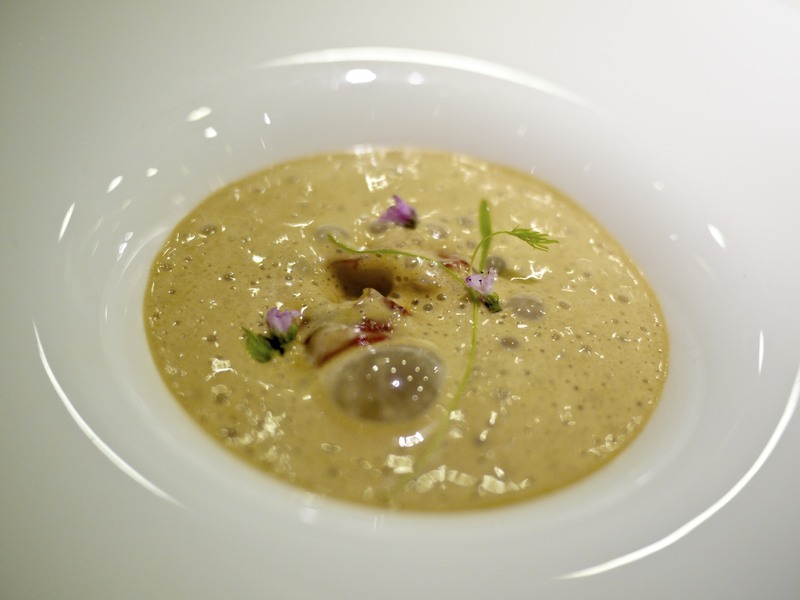 I had never encountered this unique combination, which started off rich and deep from the amalgamation of the ingredients and ended with the clean finish of the oyster hiding underneath. My companion and I had no words to exchange other than the look of bewilderment and delight, interrupted only with nodding heads each time we took a bite! 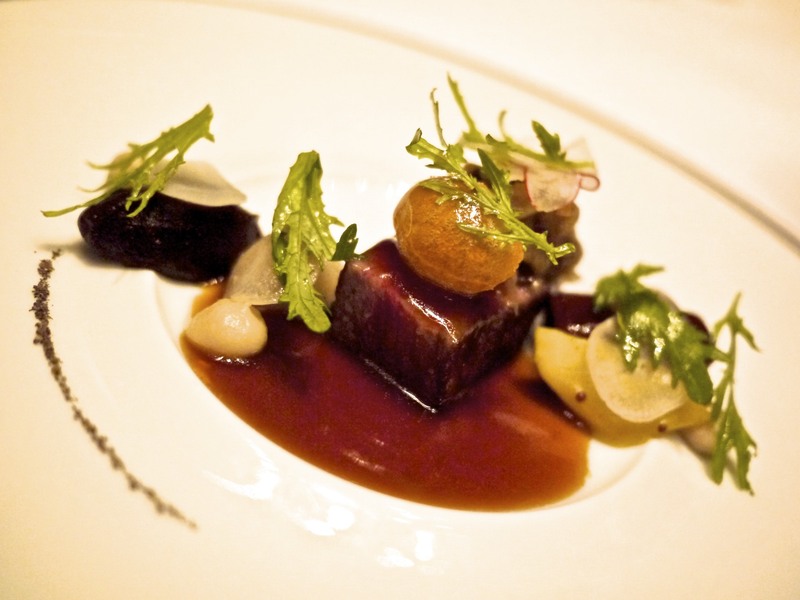 The subsequent course of the Kagoshima wagyu beef striploin with a purée of oven roasted Cevennes onion and braised short ribs was great but was a little overshadowed by the preceding course. Don’t get me wrong, I was quite impressed with the marbling of the beef and the four distinct preparations of the onion – puréed, thinly chopped, caramelized and pickled. I think it is fair to say that most meat dishes I have come across would struggle to follow the previous act. Similarly, I couldn’t argue with the quality of the cheese supplied by Bernard Antony. 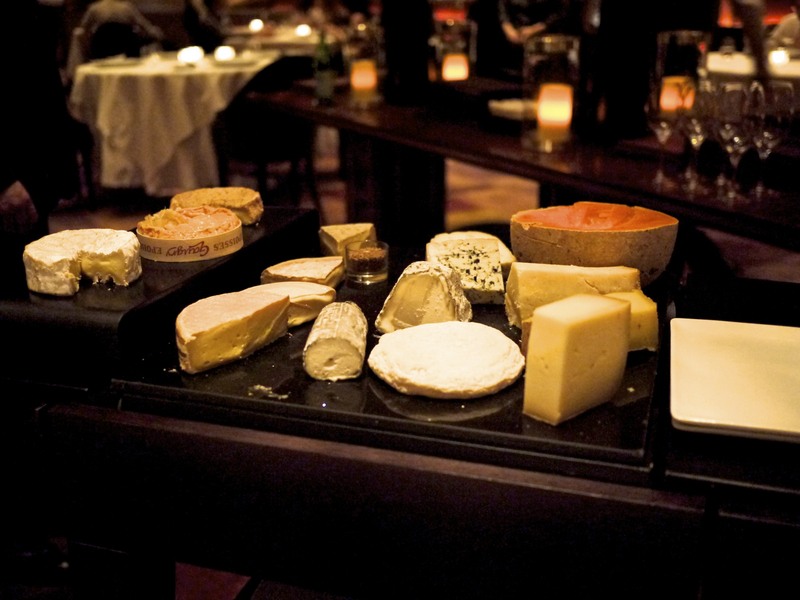 I was pleased to see a great selection of unpasteurized cheese including my favourite Epoisses and Mimoullete, nicely matched with a glass of a 2004 Luis Canas, Seleccion de la Familia, Rioja. I didn’t quite know what to expect for the finale as a typically rich French dessert would have rather been disjointed to the fresh and light arrays of dishes I had thus far. 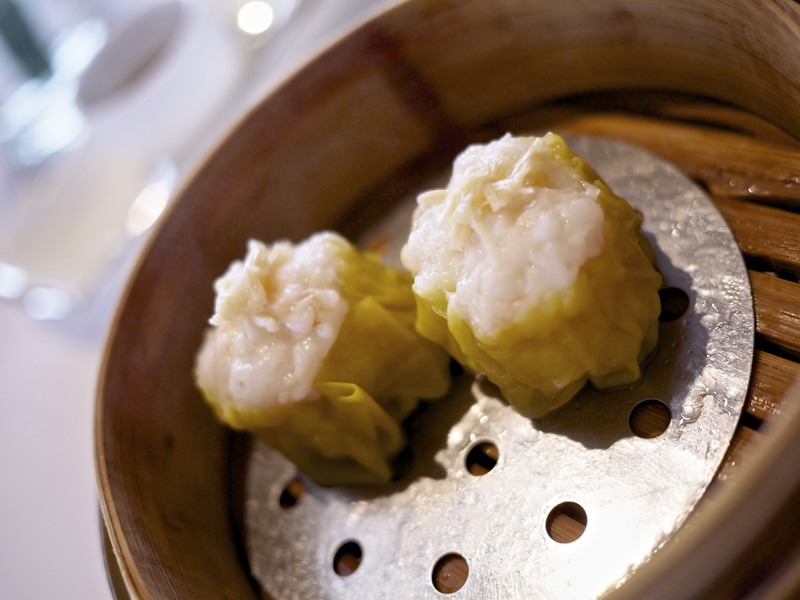 I also feared that it would be difficult to follow the extraordinary dishes that had preceded it. However, the Amaho strawberry from Fukuoka, served in a hibiscus infusion, olive oil, Sichuan pepper and cassis granite was light, refreshing and nothing short of novel. 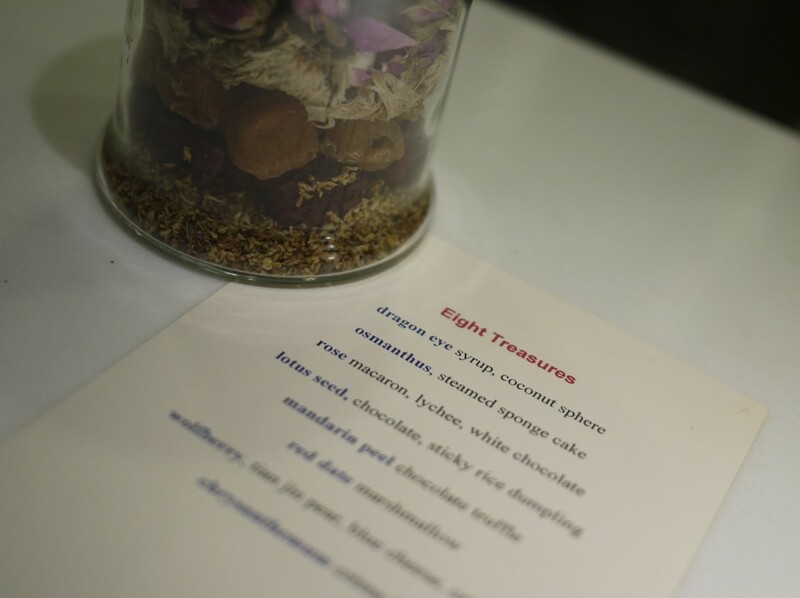 The flavour from the strawberry was as impressive as the ones I had tasted in season in England and the Sichuan pepper added an interesting dimension of spice to the contrasting cold cassis granite. The finale of the tasting menu was an Abinao 85% chocolate soufflé served with a cacao sorbet on the side. 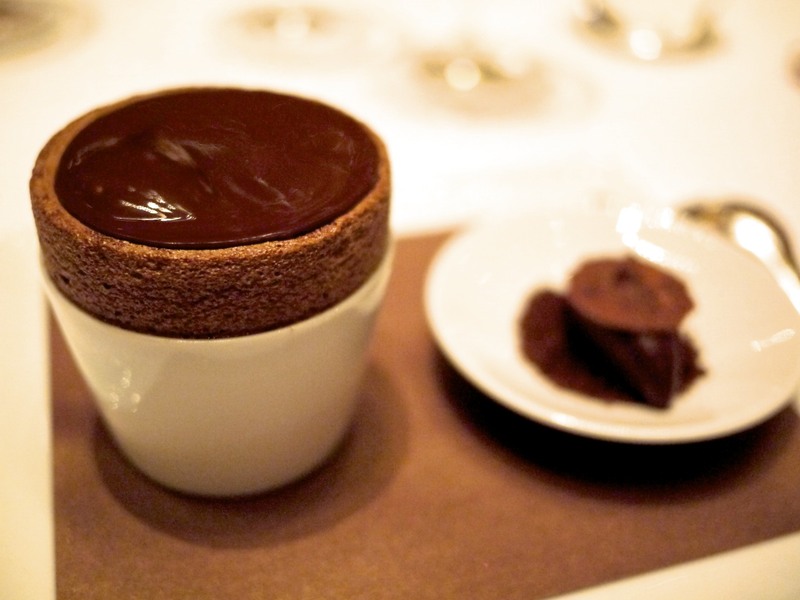 Whilst chocolate soufflé is perhaps not construed to be the most original of dessert, the execution was against flawless and exemplified Ekkebus’ roots and skills in traditional French cuisine. The contrast of the flavour and differing temperatures of the melting chocolate and sorbet lifted this dessert to something more interesting, yet familiarly comforting. 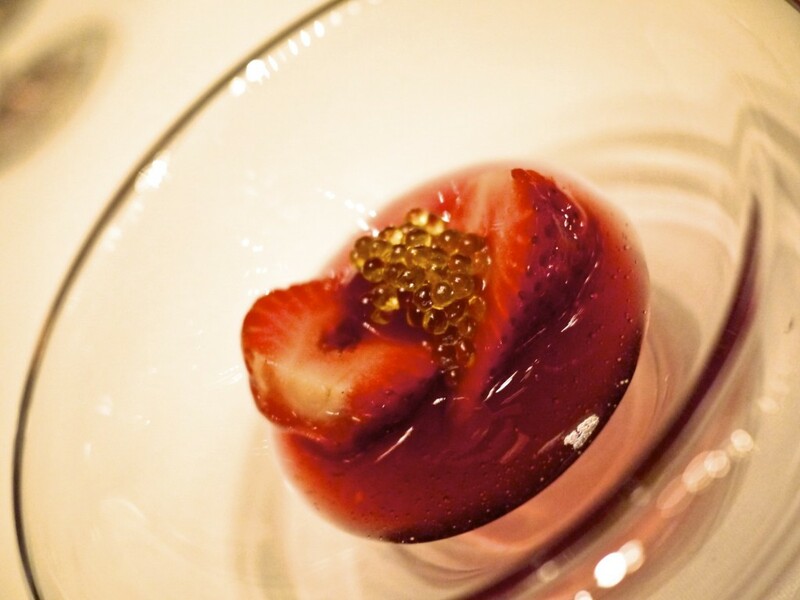 Naturally, the quality of the ingredients used to make the desserts made the difference as well. 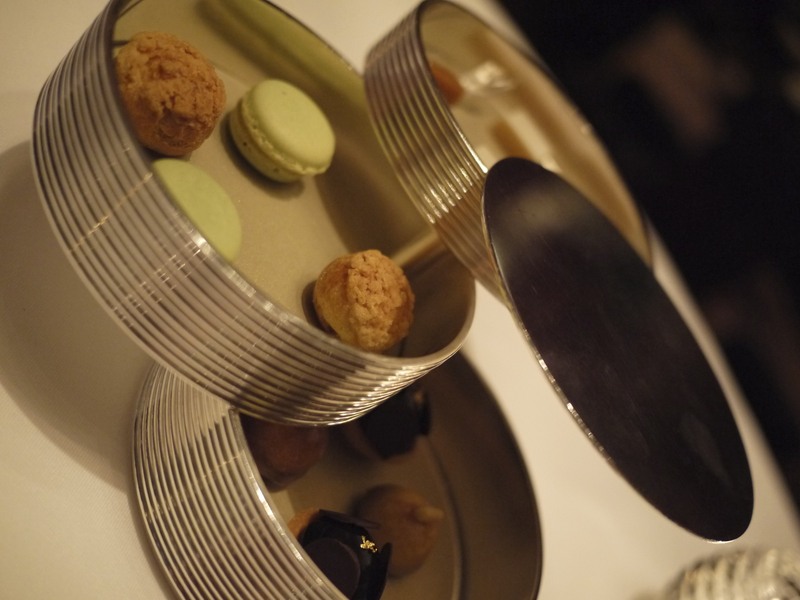 The petit fours looked amazing but I struggled to get most of them in as I was utterly full and exhausted from the culinary experience over the past four hours, not to mention the copious amount of wine that was paired with each course. While I expected possibly a few good dishes from this meal, I am always cautious when restaurants focus on foreign cuisines and flavours, given the obvious geographical disadvantage of sourcing the produce. In this case however, I was blown away. 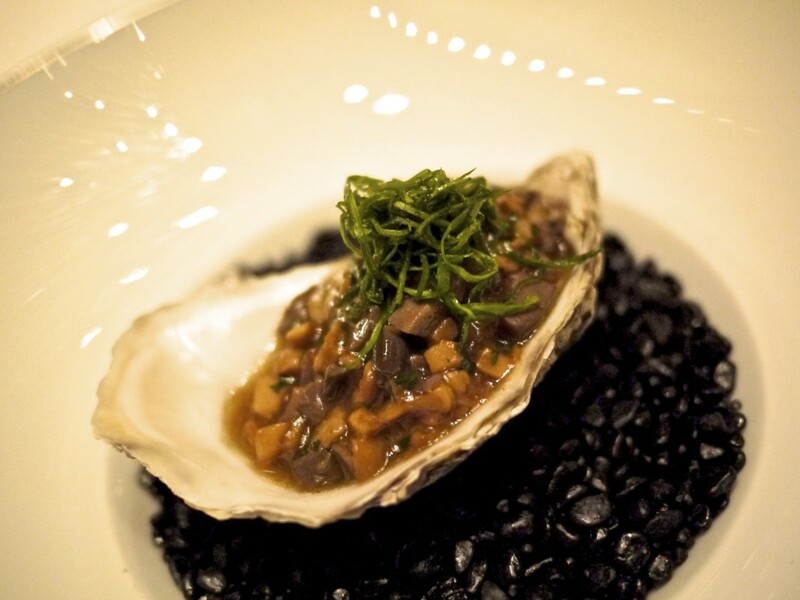 Having tasted some of the finest Paris had to offer, I was quite taken by Ekkebus’ skills and ability to efficiently utilize and incorporate the wide array of Asian produces to his cooking style; the ebisu oyster being a perfect example. 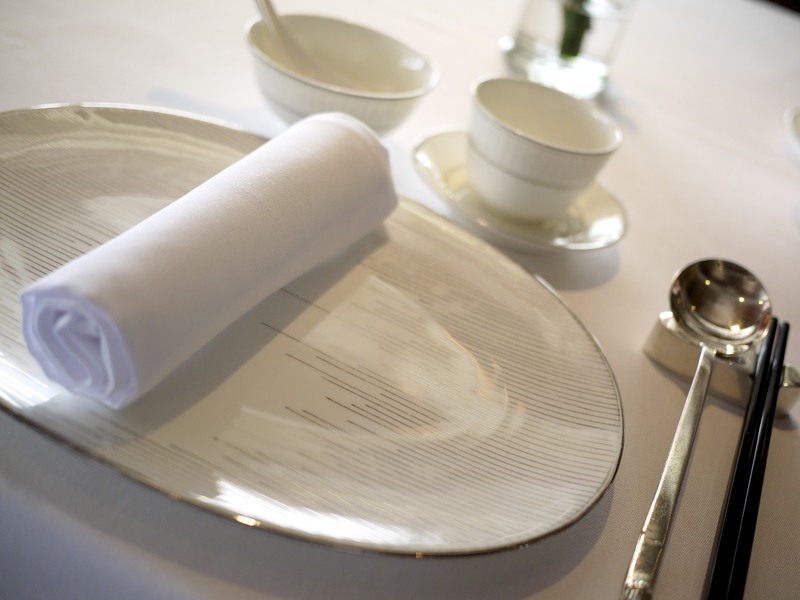 What’s more, I think many of us forget the importance of that balance between personable and professional service skills of the front of house that still remains absent in majority of fine dining establishments across Asia. This was something that Amber mastered with abundance, and they did so with a passion that was contagious. There’s so much Asia has to offer and I look forward to the discovery of other great produces through Ekkebus’ cuisine over the forthcoming years. This entry was posted in Hong Kong and tagged Amber, Richard Ekkebus on April 20, 2013 by admin.